Robert Morley (right) welcomes Tom Poston (left) to The Old Dark House. Image: Midnight Only. William Castle‘s The Old Dark House (1963) is often pooh-poohed as an inferior film. Just do an online search for this comedy-horror-mystery and watch the disdain fill your screen. Listen to us, Dear Reader; forsake these naysayers. We think that if you’re ever in the mood for a rather dark and twisted comedy, The Old Dark House will be just the ticket. But first: Who is this guy by the name of Castle? William Castle (1941-1977), American producer and director, is best known for low-budget horror flicks that have gained a sizable cult following over the decades. Castle was also famous for his innovative movie “gimmicks.” For example, when 1959’s House on Haunted Hill was released, Castle rigged a plastic skeleton in movie theatres to fly through the audience at a crucial moment during the film. SO! How do you like him so far? The Old Dark House was the only movie that Castle made at British Hammer Films. The film itself is a remake of the highly-praised 1932 version, and is loosely based on the 1927 novel Benighted by J.B. Priestley. The only trouble with this film, in our opinion, is that you’re supposed to figure out which character is a murderer but you end up having too much fun to even try. Tom Poston plays Tom Penderel, an American car salesman who lives in England. One stormy night, he is asked to deliver a car to Femm Hall, his friend’s old stone fortress. When he arrives at the decrepit citadel, Poston discovers his friend is newly and suddenly deceased. Poston is invited to stay the night with his friend’s bizarre but delightful relatives, some of whom will come to an untimely end during the night. By the time the movie is over, there will also be several attempts on Poston’s life via acid, quicksand, a meat cleaver and – worst of all – an angry father. Another wonderful cast member is Joyce Grenfell, who plays the mother of Poston’s deceased friend. She is a habitual knitter who knits the story of her life into her creations. In one scene she shows Morley her knitting and cheerfully explains, “[This is] the day I lost my earrings, the day we lost mother.” It’s a pity she’s killed off so early in the film. Every character is outlandish and entertaining, but we’ll leave the rest to discover for yourself. And what of William Castle in all this? Castle takes pains to develop the plot, with all its intricacies, but the movie doesn’t feel long. It clips along at a fast pace and when it’s finished you can’t believe it’s over already. The Old Dark House was not well received by critics when it was first released, and there are folks today who dismiss it. But we think you’ll find this movie charming in a dark sort of way. You’ll have as much fun watching it as, we suspect, William Castle had making it. The Old Dark House: Starring Tom Poston, Robert Morley, Janette Scott. Directed by William Castle. Written by Robert Dillon. Hammer Film Productions, Colour, 1963, 86 mins. This post is part of The William Castle Blogathon, hosted by the lovely Last Drive In and Goregirl’s Dungeon. Great post and great thoughts on a truly wonderfully delightful (and a little bit wicked) film. I can’t believe people don’t appreciate this film! Why so serious world? It’s time to put William Castle’s films back in theaters for late night weekend shows. It’s time for Castle to re-emerge to a new generation of movie fans. Late-night William Castle movies! Great idea! I think his films would fit perfectly in today’s zeitgeist. I had completely forgotten that Joyce Grenfell was in the film! She is delightful in whatever role she plays. I remember not liking this movie when I first watched it, probably because I had such high expectations of a British “House on Haunted Hill” with comedy thrown in, and it fell short. But every movie deserves a second viewing, so I’ll give this one another go! Joyce Grenfell alone is worth the price of admission. I really am disappointed she is removed so early from the film. Dor, I’m looking forward to reading your double-header. Glad to hear Poston is a fave at Tran B! 🙂 He’s a pleasure to watch anytime, isn’t he? It’s too bad he didn’t have a more illustrious career. I’m all over this one! Honestly, you had me at Robert Morly (he just cracks me up). But I’ve never heard of this one either and it sounds like a must see for me. And, bonus, our library has a lot of Castle’s movies, so I’ll bet I’ll find it there. Thanks for this R.A.! I’m with Sarah. I’ve not heard of this one either but Robt. Morley’s name on the marquee is always worth the price of admission. And it will be good to see Tom Poston in something other than a half-hour sit-com re-run, too. Besides, this is about the only “scary” film type I can handle, one that doesn’t take itself so seriously. Thanks for suggesting another film for me to watch. This is about the only scary type of film I can handle, too. But this movie is a lot of fun. It has some wonderfully eccentric characters who give the movie heart. I haven’t seen this movies in ages and you have inspired me to check it out again. 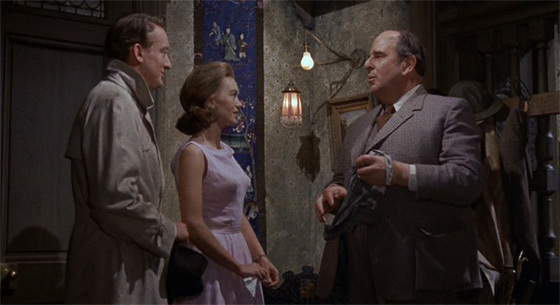 Robert Morley is always fun (he’s awesome in the delightfully twisted THEATRE OF BLOOD with Vincent Price and Diana Rigg). Didn’t Tom Poston marry Suzanne Pleshette? Now that you mention it, I think Poston did marry Suzanne Pleshette. Robert Morley always gives audiences their money’s worth, doesn’t he? I’ve seen a fair few William Castle movies, Ruth, but not this one…it sounds like fun, and who doesn’t like an “old dark house” movie? Not sure about Tom Posten as the lead, though…but you’ve sold me on checking this one out sometime. I have to say I agree with you re: ignoring the naysayers on boards like the IMDB. There are any number of films that I personally adore that come in for a good thrashing from such “critics.” Always a good policy to try it first and make up your own mind. Thanks for the nifty review! You may be pleasantly surprised at Tom Poston as the lead. I think he’s a good fit in this zany movie. I agree re: critics. 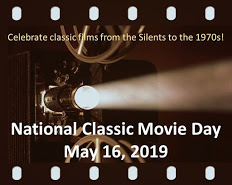 It’s always interesting to see what they they say about certain movies but, in the end, we all enjoy – or dislike – movies for our own reasons. First of all, thank you for stopping by my blog and for leaving your condolences on the loss of my sweet Nikki dog. Losing her has been difficult, but the caring and kindness of friends has been comforting. I had never heard of William Castle before this blogathon. Thanks for broadening my knowledge base a bit. The skeleton flying through the air thing would have probably scared me out of my wits. Critics’ reviews can sway a person’s opinion, and I try not to read them until after I’ve seen the film. You are the kind of person who always tries to find something good to say, which is why your reviews are always a pleasure to read. Ha! The “It May Not Happen” painting is really great. I want one too. Yes, I want that sign too! As for the movie, it really is a lot of fun. May not be suitable for wee ones, but I think older kids would get a kick out of it.